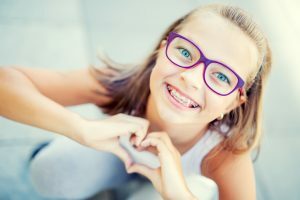 It’s best for the orthodontist to see children by the age of 7 to advise if orthodontic treatment may be required and the best time for that patient to be treated. The first permanent molars and incisors have usually come in by that age, and cross bites, crowding, and other problems can be evaluated. When treatment begins early, the orthodontist may be able to guide the growth of the jaw and guide incoming permanent teeth. Early treatment can also regulate the width of the upper and lower dental arches, gain space for permanent teeth, avoid the need for permanent tooth extractions, reduce likelihood of impacted permanent teeth, correct thumb-sucking, and eliminate abnormal swallowing or speech problems. In other words, early treatment can simplify later treatment. Consultation appointments for children are a great idea, not to mention quick and easy. It will give you peace of mind knowing that early intervention can be done if needed. No referral is necessary, just call the office to book a consultation with Dr. Liss.